Gelest, Inc. Silanes and Silicones are important components in a variety of biotechnology applications ranging from diagnostic devices to biomaterials. These materials are designed to attach to an inorganic surface, typically glass, and provide an organic functionality to carry out a desired chemical interaction or reaction. 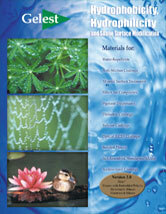 Examples would be to impart hydrophobicity or hydrophilicity to a surface or to react with biological active materials. Such reagents are found in the areas listed here.